Farmer field schools are traditionally an adult education approach—a method to assist farmers to learn in an informal setting within their own environment. FFSs are ―schools without walls'' where groups of farmers meet weekly with facilitators. A farm field school (FFS) consists of 25-30 farmers who meet one morning every week for an entire crop growing season. A FFS is facilitated by extension workers or skilled farmers. Employing non-formal education methods, the field is used as the primary resource for discovery-based learning. The process is facilitative and respects the experience that farmers bring with them. 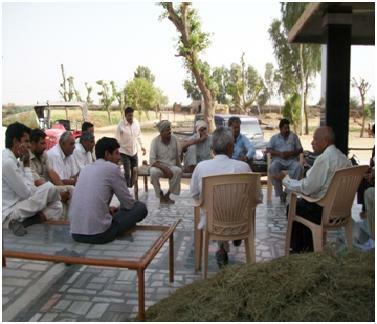 Farmers work in small groups to ensure that each one's ideas are shared. In the FFS there is acceptance of the uniqueness of each participant. The activities are designed to respond to the immediate needs of farmers and are general towards encouraging creativity and independence. Navyug Vikas & Anusandhan Sansthan's trainer played a crucial role of facilitator in ensuring that the environment and all resources contribute to the farmer's learning experience. The total no. of beneficiaries who were benefitted from the farm field schools were 90 farmers. All these farmers later on helped other farmers in their respective area to adopt the best practices of farming to increase the productivity. At School farmers scientist and NYVAS staff (at all critical phases) meet about 7 times, right on the farmer field.